Everywhere he goes, crowds gather to meet Buzz Aldrin. He's a world-class hero, a larger-than-life figurehead, and the best known of a generation of astronauts whose achievements surged in just a few years from first man in space to first men on the moon. Now he pauses to reflect and share what he has learned, from the vantage point not only of outer space but also of time: still a nonstop traveler and impassioned advocate for space exploration, Aldrin will be eighty-six in 2016. Second comes right after first. NASA protocol should have placed Buzz Aldrin on the moon first, but rules changed just before the mission. Buzz discusses how he learned to be proud of being the second man on the moon. Look for opportunities, not obstacles. Buzz was rejected the first time he applied to be an astronaut. Failure is an opportunity to learn to do better. Always maintain your spirit of adventure. For his eightieth birthday, Buzz went diving in the Galapagos and hitched a ride on a whale shark. He stays fit, energetic, and fascinated with life. 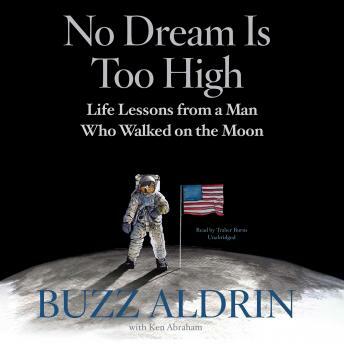 No Dream Is Too High is a beautiful memento, a thought-provoking set of ideas, and a new opportunity for Buzz Aldrin to connect with the masses of people who recognize his unique place in human history.